In the 18th century, it was against the law for slaves to read or write. 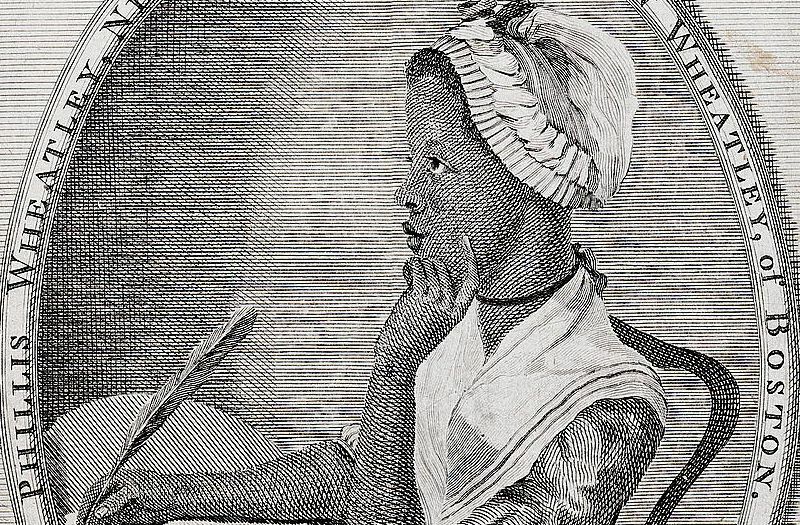 Why do you think Susanna Wheatley encouraged her daughter to teach Phillis Wheatley? According to the article, Phillis Wheatley's poems were influenced by pride in her African heritage and religion. If you wrote a book of poetry, what would influence your work? If slave owners read Phillis Wheatley's work, how do you think they could not see it as proof of slaves' intellectual abilities? According to the article, the Wheatley family provided Phillis Wheatley an "ambiguous haven" while she was a slave. And she died just 10 years after they freed her-"in abject poverty, preceded in death by her three children, surrounded by filth, and abandoned, apparently, by her husband, John Peters." Even though she was free, do you think the Wheatley family had a moral obligation to continue looking after her? Why or why not? As a class, discuss the types of exhibits usually seen in a museum. (i.e., historic objects, scientific specimens, living organisms, paintings, photographs, documents, soundtracks, etc.) Point out that exhibits can take up entire rooms or be so small that several objects fit in a glass-fronted case. And many museums also use technology to educate visitors. They show movies, have digital displays and even have interactive elements to heighten the visitor's experience. Instruct students to examine the exhibitions of the NMAAHC. Discuss the types of exhibitions the museum has. Challenge students to identify something important that is missing. Give students time to explore the museum's collections. Instruct them to select appropriate items for a museum exhibit on their selected topic. Encourage them to conduct additional research to learn more about those items. Invite students to present their finished exhibits to the class. Challenge them to explain why they think the subject of their exhibit is important and what the objects in their exhibit teach viewers about black history. Have students complete the project in small groups. Instruct groups to identify a topic and select one item they think is most important to include in the exhibit. If necessary, suggest additional resources they could use to learn more about that object. Give students time to create a poster or diorama. Encourage them to brainstorm ideas for digital components that could also be featured in their exhibit. If two or more groups selected the same subject, have the class brainstorm ideas about how the objects could be combined into a larger exhibit about that topic. Have students complete the project in small groups. Instruct groups to select one topic they think should be featured in a museum about black history. Challenge students to select several items from the NMAAHC collections that they think should be included in this new exhibit. If necessary, suggest additional resources they could use to learn more about the objects they chose. Tell groups to create a poster or diorama for their exhibit. Encourage them to also write a detailed outline for one digital component that could enhance the visitor's experience with their exhibit. Encourage the class to compare the end results if two or more groups created exhibits based on the same topic. Give students time to review the current selection of NMAAHC exhibitions. Then have the class brainstorm a list of other topics that could be featured in the museum's exhibitions. Divide the class into small groups and assign each group a topic. Instruct students to explore the museum's collections and identify what they consider to be the three most important items related to their topic. Tell them to create a separate display for each object. Displays can be posters or dioramas or students may use a digital format of their choice. Once all displays are complete, challenge groups to create a digital mock-up for room-sized exhibit based on their topic. Remind them to show where each display will be located in the room. Divide the class into small groups. Instruct students to review the current selection of NMAAHC exhibitions. Challenge groups to identify the three topics that they think should also be featured in the museum's exhibitions. Encourage them to explore the museum's collections and identify artifacts associated with each topic. Inform groups that they will create a digital version of a three-room museum in which each room has its own topic. It is up to them to decide how to break down the tasks. Their end product should include detailed examples of at least three exhibits in each room as well as a summary telling how the digital elements they include will enhance the visitor's experience. Read this article from the National Museum of African American History and Culture to learn more about Phillis Wheatley and four other African American women who made a difference. This exhibit from the Smithsonian American Art Museum offers a new introduction to the Civil Rights movement through the unique lens of Smithsonian collections. Drawing connections among art, history and social change, it provides educators with tools to help students reimagine and reinterpret the long struggle for civil rights, justice and equality in fresh ways. In these lessons from the Smithsonian Center for Learning and Digital Access students examine works by African American painter William H. Johnson to learn about his milieu as well as his style. Younger students will list the elements of pictures, identifying colors, shapes and objects. Older students compare Johnson’s work with that of painter Allan Rohan Crite. Use this teacher’s guide from the Center for Folklife and Cultural Heritage to explore the history and cultural traditions of Maroons, descendants of Africans who freed themselves from captivity in the Americas. This virtual exhibit from the Smithsonian Anacostia Community Museum examines faith and spiritual traditions in the African American community and the church as an agent of community and economic development. It includes short articles, interviews with community members and extensive resources. In this lesson from the Smithsonian Center for Learning and Digital Access, students look at both African American history and portraiture. Portrait subjects include Sojourner Truth, Mohammed Ali, Ella Fitzgerald and Leontyne Price. Younger students make photographic “calling cards.” Older students research portrait subjects.